Ezk 9:1-7; 10:18-22 I saw six coming from the upper gate, each with a weapon, and one dressed in linen. God, to the one in linen: "Pass through Jerusalem, and mark a “Thau” on those who moan over the abominations practiced there. To the others: "Follow after him and strike! Wipe out everyone except the marked...."
Ps 113:1-6 "The glory of the Lord is higher than the skies." Servants of the Lord, praise God from sunrise to sunset. Who is like God, enthroned, looking on heaven and earth? Creighton: The readings challenge us about judgment: God's of us and ours of others. God marks the worthy, true worshipers. What are the 'idols' that divert me today? What do I really need? Consider the Suscipe, especially Schutte's These alone are enough. One Bread One Body: We've always lived in a divided Church, in Christ's broken body. We've learned to live with disunity, but God calls us to preserve and restore unity (Eph 4:3), reconciling (Mt 5:23-24; 2 Cor 5:18), and making peace (Mt 5:9). If you care for Jesus' broken body, work for true unity. Passionist: In the midst of "abominations," the glory of God rises up. God's presence is with us, not just in the temple, and God hears our cries. We can walk in trust and hope. / Today's gospel gives steps towards right relationships. Brooding over a grievance can make it harder to go to the offender. If face-to-face fails, bring others to persuade him to be reconciled. If that fails, seek the community's help (not coercion) to restore the relationship. If even that fails, "treating like Gentiles/tax collectors" may not mean abandoning them since Jesus had fellowship with the 'unclean' too. Do I seek to repair/restore broken relationships? About the 'Thau,' allusion to custom of marking servants: Idol worshippers often bore their idol's mark. Hebrew ת here transliterated 'tau' St. Jerome and others thought looked like a cross, so they were signed with the sign of the cross. (Samaritan coins do have a tau in the form +, "St. Andrew's cross.") Commentators said the signing meant there's no redemption but by the cross of Christ; true as it is, it's not from this text; the Hebrew is actually "make a mark/sign a sign" but doesn't say what sign. It was like sprinkling lamb's blood on Israelites' door-posts: a sign of whom to spare. God will distinguish between innocent and guilty, between penitent and hardened sinner. Universalis: SS. 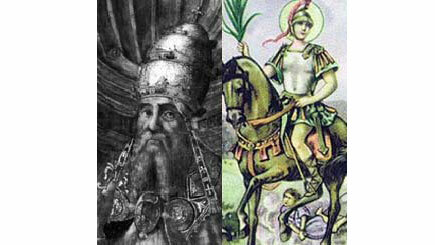 Pontian, pope, and Hippolytus, priest, Church writer; see Catholic Encyclopedia re Pontian and Hippolytus. St. Fachtna/Fachanan of Ross, bishop; Bl. William Freeman, priest, martyr: "I came here to die for my faith, the true ancient and Catholic faith."